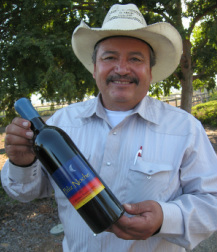 Felipe Hernandez is proud of his signature Cabernet Sauvignon. Felipe Hernandez realizes his dream with Feliz Noche wines, a labor of love that is making many "Happy Nights" for those who love his wine. His big red wines are plush, velvety, and downright delicious, and his story inspires all who work hard to achieve the American Dream.